Runs small! 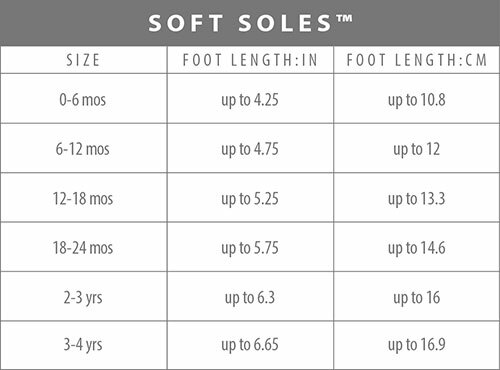 I ordered a pair of these and another soft sole (both robeez) both in 12-18mo and this pair was smaller than the other soft sole shoe and didn't fit. I bought these for a gift. Have purchased many Robeez products, especially their shoes, for boys & girls since 1996. I have always been very pleased. Wish I had had them whey my kids were little! I had an issue with a pair of shoes so after a couple of emails back and forth with costumer service they were help us choose the best shoes. So, this sandals not only are adorable but so soft! Perfect for new walkers. Gentle in my baby’s ankles. The way the leather and elastic come together at the ankle really dug into my baby’s skin and left red marks. I had him wear these a couple thines, and he would whine and tug at them. Don’t waste your money like I did. These shoes are amazing! Go on easily, stay on beautifully. Look good and durable. Cute, soft sandal but it runs large. I ordered the 6-12 month size for my 10 month old and they are too big to wear. I hope he grows into them by summer. Robeez have been my favorite baby shoe for the last 13 years! Very versatile and they looked good with most of his outifts because of the color. The only negative was that the elastic would leave a mark around his ankles after a long period of wearing them. But the fit was perfect. My daughter had bought a pair of Robeez at a consignment sale. I just loved them and went online to check out locations where they could be purchased. There were so many styles to select from but I finally narrowed it down to three pair. I kept my grandson today and he wore the navy ones. It was the first time he had them on----easy to get on and stayed on all day (he is not in love with having to wear shoes but he never tried to take them off). The leather is so soft it is like walking barefoot. I just love these. Too bad your company does not go past 24 months in the sizes. The shoes are pretty easy to slip on and comfortable for my son to wear. They've been very durable and he walks easily with them.